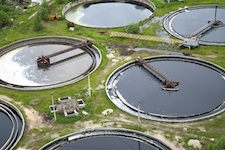 It’s true that the collection, distribution and treatment of drinking water and wastewater in the U.S. uses up significant amounts of energy and releases some 116 billion pounds of carbon dioxide (CO2) each year—as much global warming pollution as 10 million cars on the road—according to the U.S. Environmental Protection Agency (EPA). Nationwide, around four percent of power generation is used for water supply and treatment, but in certain drier parts of the country that number is far higher. For instance, in California the water sector is the state’s largest energy user, accounting for some 19 percent of total electricity consumed there. The key to staving off water emergencies is to use less. “Reducing water consumption saves energy because less water needs to be treated and pumped to end users,” reports the Natural Resources Defense Council (NRDC). “Moreover, when energy use is reduced, water is saved because less is needed in the operation of power plants.” Some thermoelectric power plants, for example, use some 100 billion gallons of fresh water each day, which translates into 25 gallons to produce each kilowatt-hour of electricity. Another way to reduce waste is by fixing leaky aging water pipes throughout the U.S. The Congressional Budget Office estimates that many drinking water systems across the country lose as much as 20 percent of treated drinking water each year due to leaks in their pipe networks. Making a concerted effort to fix these systems would go a long way toward preserving our aquifers. Water waste can also be reduced significantly if new buildings and developments integrate so-called “low impact design” concepts into the planning stages, whereby the landscaping surrounding structures is designed to mimic the natural hydrology of the site, including strategically placed native plants, rain barrels, green roofs, porous parking lots and roads, etc. The idea is to retain rainfall on site where plants and soil can filter pollutants out naturally or where it can be re-used in gray water applications (such as for landscape irrigation or water for toilet flushing). Especially parched parts of the country can recycle and reuse wastewater on a larger scale to avert the costly importation of more fresh water. Much water is also wasted in agriculture. Farmers can help by adopting any number of efficiency measures at their disposal, mostly in the realm of efficient irrigation technologies. “Switching from flood irrigation to drip irrigation, for instance, can increase water use efficiency as much as 40 percent,” reports NRDC, adding that even small changes can mean a 10-15 percent gain in water use efficiency on farms. And everyone can do their part by turning off the water while brushing teeth or shaving and limiting the length of showers and the amount of lawn watering we do. Beyond these little things, home- and business-owners should consider investing in water fixtures that meet the EPA’s more rigorous water efficiency “WaterSense” standards (look for labels accordingly). To qualify for the label, fixtures must be at least 20 percent more efficient than current standards specify, while performing as well or better than less efficient counterparts. The price of WaterSense fixtures may be slightly higher, but most consumers will make up the difference quickly if they are replacing older inefficient faucets, taps or toilets.